Dear defenders of Ukraine! Congratulations on the Day of Defender of Ukraine! This is a real celebration of courage and dedication, a celebration of chivalry and nobility, which are possessed by real defenders, liberators and defenders of Ukraine, at the same time became the personified holiday of all men. This holiday is everyone who at one time or another gave his knowledge, strength, courage and professionalism in the defense of our state. You proved that you are worthy descendants of the Ukrainian Cossacks. We sincerely wish you good health, unbreakable spirit and a peaceful sky! 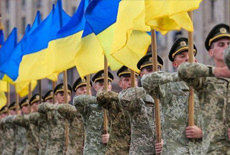 On the occasion of the holiday, we congratulate all those who bear the high title of defender of Ukraine! We send heartfelt congratulations to veterans, war veterans, and servicemen, soldiers of the reserve, parents and mothers of soldiers and wish goodness, peace, happiness, and peace to you and your families. Also, we heartily congratulate all with a special Day for the Ukrainian – the holiday of the Holy Protection. In today’s difficult circumstances of the life of the Ukrainian people, we would like to wish the Most Holy Lady of the Protection of us over us. We wish all of us Cossack actions, victories and deep spirituality. Let the desire to defend their freedom and independence will continue to be an indispensable feature of the Ukrainian people.